this is how force arena end : Cheated character and high price to buy it. 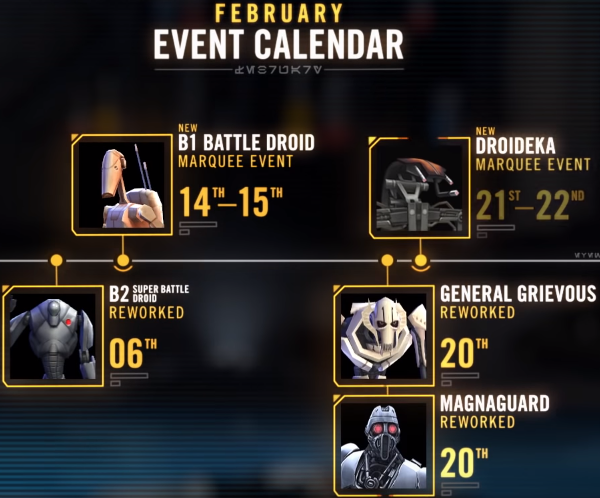 So it’s confirmed that Droideka will be a marquee release. It had been confirmed before in GC videos. I’ve grown tired of searching other sites for “official” information. I mean EA posted a video of it when the road ahead came out (timestamped where it told us Marquee). and that dev post was released in arena subforum for some reason, instead of dev announcements... pretty obscure. not a correct placement at all. @shhfiftyfive which post? All the reworks and new character kits have always been released in that area. This is laughable. And let's be honest here, CG. You have certainly evaluated the marquee packs the past year or so; we had that $30 ship bundle that no one wanted. Remember that one? Yeah, we do too. I'll spring for a $9.99 pack to get teh 4th * on occasion. Now? No way at all am I buying this $19.99 pack. As previously stated by others, there is no benefit to me to do so. If you gave $15 worth of crystals instead, then yeah, I might do that. But this "bundle" gives zero incentive to purchase it. Agreed. I was buying the $10 but not these. If everyone sticks to their guns and actually doesn't buy them then they won't do this again since there is no added value. Whelp...$30 ship bundles stopped me from buying them...guess this will solve that problem for character bundles now too. I’ll probably buy B1 just to demonstrate that desire is higher for the $10 bundle, but CG can bite it on the Droideka bundle. Why can't you show us the drop rates now on the mega marquee pack? That will help make us feel good (or bad) about what this means for us. They're legally required to disclose the drop rates, but they're not required to promote them. They'd prefer you not look at them at all, but hey rules are rules. A lot of questions about what to do. Revani in the arena and falcons in the Navy did not give any chance to the people even in those places that before were waste. The answer is simple - do nothing. EA themselves killed their game and enjoy it. The account went on for months. In the game, almost no one left. The newcomers were not so and never will. Either will sit in the top 7K enjoying the game. In any case, they will not compete in the arena, they will not pay - so do not take them into account in the statistics. The outflow is constant and for a very long time. Since the release of Revan, he's just the cars went. And now when you retry on the event of Revan - the price of the same service, sales fell badly. Accounts that previously went for$ 1K can now be found for 200. For reference, this is the account with all the characters in 12+. Even the owners of such accounts are tired of this garbage. So what to speak about the average player who has one pack in T11 is typed? Against the falcons what can he do against dedate 500-700 of Revans in the arena? They took it away like a week after they implemented it.... Mainly because we broke it when they revamped the Sith Raid Rewards in the beginning of 2018. I guess they figured it wasn't great for company moral when your lead executives have more "dislikes" than any other post or group of posters. Had to login to reply to this thread: also hate the change. Will not be buying the $20 packs, I used to buy pretty much all the $10 ones. Once in a while would buy a vault for crystals if I felt like splurging. But this is just a bad deal. Pls reconsider your merchandising: the single digit $9.99 packs are what I'm ready to spend on a game on a whim. I won't do $20 that way. CG, I would recommend your marketers give back their diplomas and go working on a farm or a car factory coz it seems that they are really incompetent in their current job. The typical way bundles work is that they give you more products together at a LOWER price than the sum of the prices of individual items. So when you bundle something with another something (in this case with another bundle), it should be cheaper to add more value and encourage people to buy it, coz they may not need _everything_ in the bundle, but the price/value ratio is still worth it for them. This advice was free, you're welcome. 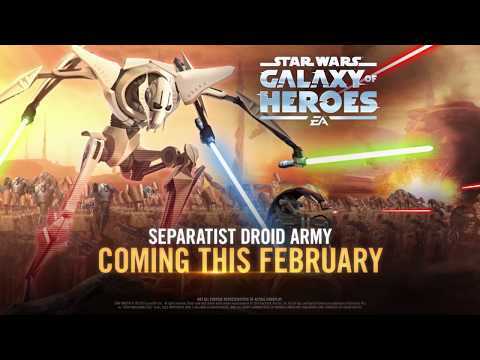 I don't plan to buy the Droideka bundle as I have close to zero interest in separatists. But I usually buy those bundles that contain characters I like. (Besides that, I want to support the game every now and then appreciating your hard work CG, which is not always good, but still...) Well, I buy them IF you don't pursue this predatory strategy any further. I always thought that the prices are outrageous (I don't want to blame you devs because of this, coz I guess it's mostly because of EA), but I've found the $10 bundles worthy enough to show my support towards the game and to get a head start on farming. "-I wanna buy a piece of chocolate. -Here it is, you can buy it with a dumb car. -But I don't need a car, especially not a dumb one, I only want chocolate. -I hear you, so to make up for this little inconvenience, I give you two more windshield wiper blades as backup to offset the additional thousands of dollars." So if you want to achieve higher sales, add something VALUE to the bundle, say, double the crystals in it. Yes, I wrote double, coz it literally doesn't cost you a penny, but it may rocket your sales. If not, you lose absolutely nothing, and you can look for other ways to increase revenue. (But not in such a dumb way.) Did you really think that people will applaud and cheer that you're forcing them to buy something they may or may not need or want without giving any discounts/compensation? Please don't think that all of your playerbase is that stupid. There is literally no reason to spend money on this game. My spend total still sits at $0.00. Do I have the greatest deck? No. Am I having fun? Yes. Do I care that they doubled a pack price? *checks wallet of money not spent on EA/CG* No. That's great that you are ftp and it's great that you are having a good time playing. However, you really shouldn't advocate 0 spending. If 0 spending actually occured there would be no game. You should actually be encouraging others to spend so you can keep having a blast in a game you like that's costs you nothing, lol. When did they change all the packs to 'tap for price'? This is uncool because it takes me to the Google Play "confirm purchase" screen. I didn't want to purchase the pack, I just wanted to see its cost. They didn't change anything. that happens sometimes. Not sure where the disconnection happens but it resolves itself in a day or so. The Marquee bundles haven't been $9.99 for awhile, close to a year I think. Maybe I'm wrong since I haven't bought a Marquee bundle for some time. I say this because the last bundle I did buy was the T3-M4 bundle, and it was $14.99. Just like the current B2 bundle price. Extrapolate that $14.99 as the new Marquee bundle price and add the $9.99 crystal pack. That is a $24.98 Marquee bundle for only $19.99. A 20% savings. Inflation, business expenses, price of milk; whatever the reason, CG has decided to charge more for the same product. Remember when a pack of gum cost a quarter? Today that same pack of gum costs forty cents. Bad, bad move CG. This is counterproductive from a monetization standpoint, and it shows that the marketers/bean counters really don't understand their buyer at all. I've said it forever... these packs need to be cheaper if they really want to entice the buyers. Price increases won't stop whales, but it will stop the casual buyer. $10 was just on the threshold to make it palatable for many people to buy the occasional pack every month or two months. I assure you that if the price of the packs was $5, it wouldn't just double the purchases, it would probably triple or quadruple them. $5 is a pretty magic number amongst splurge buyers... look at the rash of "dollar section" purchases people make, the success of dollar stores, and even the cost of your average premium coffee at Starbucks. Most people can justify a $5 expense for fun pretty easily, but shortly north of that, they start second guessing the value and it no longer feels "disposable". Oh well, hopefully some better thinking goes into this, because I think they'll find a sharp downturn in the pack purchases from here on out until they reevaluate this price tag. I, for one, won't be buying anything with the new price structure. The real value was in the fast shards, and the crystals can simply wait. Can you imagine what an even bigger disaster the Rose and Holdo packs would have been at 10 a pop?! I have been playing this game since 2016. Been enjoying it. Mostly free to play. But spending here and there. Got a promotion a few months back and really spent a bit on this game to show my support and appreciation. Then this. In my years of playing this is the first I've logged in to the forum. EA is doing a propper job of ruining my love for an amazing franchise that I have enjoyed for decades and spend thousands of dollars on. Weather it be lego, figures, games, posters... But the way EA has been treating the franchise and its loyal fans and consumers is heart break. You won't receive another cent from me. I will wait for Ahnald, MG, CFH or a road ahead to explain me how is this a good marketing move or how will this be an advantage for players. Is this some sort of "only the biggest whales deserve to win" policy? Or are you fighting people that hoard huge loads of crystals from arenas without spending a single penny? Not a fan of this, you are just forcing crystal purchases on us. Blatant money grab. They are realising that alot of people are clearing 800-900 crystals a day from arena payouts and thus are spending less on crystals and farming required characters faster. Meanwhile, newer players who aren't F2P buy crystals either way. Or at least I bought a lot early on. To them, this might actually seem like a good deal compared to 11 bucks for 1340 crystals. But at this point, with a daily crystal income of at least 610, I'm not exactly thrilled either to say the least. The point is that this wont entice anyone to purchase. Theres no discount at all. People that are gonna buy the crystals will buy them regardless. This does nothing but push people away from buying the packs and frustrates them when they see how out of touch EA is. I wont be buying these packs and while I just kind of shrug it off I'd bet a lot of people will get upset when you add this on top of their many other foul ups. They lost my money after the Capt han crystal debacle. They're lucky this is star wars.